and <a¯i(t)>” (note the overline on the first a¯i) as per equation (10). Yes, he is no longer at Numenta. prediction paper which uses the same spatial pooler? Hmm, I’m troubled by this too. I actually had no idea this was turned on by default. We should rerun without it and see if it makes a difference. I created an internal task to check this. Thank you for pointing this out. We turned off perm boosting and compared to the results reported in the SP paper - there is no difference in results. We also observe no difference in results when we increase the permanence boosting value to 0.2, which leads us to suspect that very few columns are eligible for permanence boosting, with the rest of the SP parameters set as described in the sp_params script. You can play around with the permanence boosting parameter using setSynPermBelowStimulusInc(). As far as I know, this paper is the latest one describing the spatial pooler and I assume that it has been produced using the implementation that is the most canonical. As in, the implementation that most closely follows the most current algorithmic description of how the spatial pooler shall work. My question, then, is where this most current algorithmic description is to be found. I will happily settle for pseudo code in the most simple form as long as it is current and complete. More specifically, I would really appreciate a detailed description of synapse generation. I have experimented with random generation, linear generation and topology based generation but I still am not convinced that I’m mapping the n mini-columns onto the N bit input in a way that will let me replicate and verify the results that are presented. Have you read the spatial pooling chapter of BAMI? I’m going to update this document with Building HTM Systems, but that is a WIP and I’m taking a break from it to work on HTM School. No. I’ve apparently overlooked the whole BAMI concept. I had no idea this book was being continuously written as the research progresses. Well, now I know what I’ll be doing tonight. You are welcome, you should be aware of this, then: What Happens With BAMI? The synapses for the i th SP mini-column are located in a hypercube of the input space centered at xcixic with an edge length of γ. What (or how) is then the implementation of the positioning of the potential pool (onto an input space) of a column? Does it ensure some minimal rules to be met? How is the hypercube calculated, is there a relevant Neuroscience theory about this? I’m trying to implement an SP could someone help me answer my questions please, cheers! You may want to look through this thread and see if it helps with understanding the SP operation. [QQ%E6%88%AA%E5%9B%BE20181102152138] Sorry for disturbing. 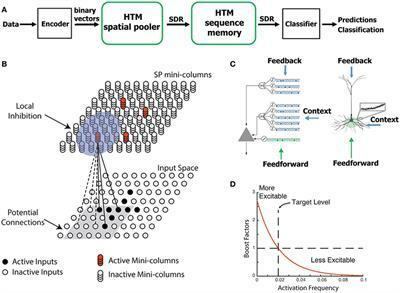 I’m reading the paper The HTM Spatial Pooler—A Neocortical Algorithm for Online Sparse Distributed Coding by Cui. While confused that in the part of fault Tolerance, it discuss the “receptive field center” with respectively showing the picture above. What does the “receptive field center” mean? I assume you have read the SP chapter of BAMI? Hey thanks for merging my Q’s. I’ve read the SP BAMI, there is no detail explanation regarding the hypercube or how it is dynamically calculated. I assume it’s the _mapColumn method of the SpatialPooler in nupic that gets the center of a column and assumes the potential pool’s geometry, however I would like to know specifically how is this exactly calculated given an input space. I was thinking there might be some requirements to be met in order to implement this properly than simply finding a center and assuming a square/cube as a potential pool geometry. For example, how are the column centers laid out must they be contiguous or can they be N cells away or can there distance be randomized? Reason I like to be specific with this implementation is because I think there are many ways to find a center of a column given an input space and each of them could influence the next generations of synapse values. Thanks! I will have a read on this. Initially though, last night I’ve read a couple of articles reading the visual cortex receptive field and I have not encountered any thing describing a hypercube as the column’s potential pool geometry (receptive field). What I found out is the on/off center-surround receptive fields which have boundaries similar to a circle. I just would like to know the receptive field for example in the SP must be calculated such as some requirements must be met. I am not sure why they chose to call the input space a “hypercube”. I see it as a square area (easy approximation of a circle) centered on the mini-column, with a size given by a side length of γ. So, a square γ x γ centered on the mini-column location, assuming that there is alignment between the input field and the mini-column cell bodies. The apical dendrites will be in the fiber mat in layer one where the cell bodies may be found in L2/3, 4, or 5. This is not an unreasonable assumption as the input/apical dendrites emanate from the cell bodies even though they may be on different layers. Within this square, some potential connections will be chosen at the creation of the model and this set will not be changed after this initial selection. The strength may be changed by training but the connection positions will not be. Thanks for explaining the biology part and sharing your knowledge. Do you have any idea as to the requirements of this receptive field’s geometry per column. I’m a bit hesitant to simply approximate the receptive field without any requirements/constraints as it may extremely deviate from its biological equivalent. Or maybe I expected too much from the current discoveries/knowledge but here are some questions I’d like to know their answers if possible. Hard to prove but I think that these tiny properties such as the geometry of the RF contributes to the emergence of the SP learning. Do adjacent columns tend to have closer centers than non-adjacent ones? Given x & y columns, is there a geometrical relationship between x’s and y’s distance and x’s and y’s center distances? Is there a theory about the overlaps of these RF that affects learning? It makes the implementation less ambiguous having these loose rules as well. I can’t answer on the best numbers for getting HTM simulations to work. As far as the actual biology I have found some papers that are fairly clear on what to expect from mini-columns. The mini-column and rising axon clusters are on 30 um centers and the dendrites reach out 250 um in any direction. that makes the “local neighborhood” for a mini-column about 225 mini-columns. For a much longer post with more intuitive graphics see this post. Note this post offers a very different view of making a spatial pooler. In the hex-grid view the hex coding replaces the SP part of HTM theory. The advantage is that individual hex-grids combine to describe a pattern that can be much larger than could be described with a single SP. Keep in mind that this is NOT standard HTM and if you play with this you are on your own as nobody but me is actually doing anything with this. My C/perl code will be utterly unhelpful to any project you are likely to be considering as it is a neural simulator model and not a computational model. I cannot thank you enough for sharing your knowledge. Yours and gmirey’s posts were more than gold. I’m happy to start from these posts, you know it might take me months to even find these publications and a year perhaps to make an even simple conclusion with regards to biological relevances. To be honest, this gave more more questions than answers, it is a good feeling as I’m even more interested about implementing the SP having to learn more on the bio part as well. I will read further and try hard to understand things. I also did a skim read and when I encountered the NS terms I felt like I was firewalking with faith only as my guarantee, this is probably the reason why HTM is not yet mainstream. I only asked for algorithm requirements and now I’m facing NS full of aliens and I’m not complaining by the way just being realistic and thankful.